The success of Saifi Village led Solidere to initiate concepts for its extension. The cluster is formed by five residential buildings set around a landscaped courtyard, with neat modern façades, offering a range of spacious apartments to include lofts with 5.75 m high ceilings, mini lofts with work/live space, ground floor maisonettes with private gardens, central hall apartments and a variety of penthouses with generous terraces. The building opening on the ring road offers serviced office and exhibition or gallery space, designed for end users in the creative industries sector. On the ground level a ‘link-gallery’ connects the office building to an upper level cultural space above a street front café. The difference in land use is reflected in the building’s façade material. The design is geared to a contemporary lifestyle, bringing a blend of services and conveying a discreet sense of luxury. Space, light, calm and comfort characterize the townhouse-like residential units, combining the advantage of a great urban location with the pleasure of a quiet green haven in the heart of Beirut. 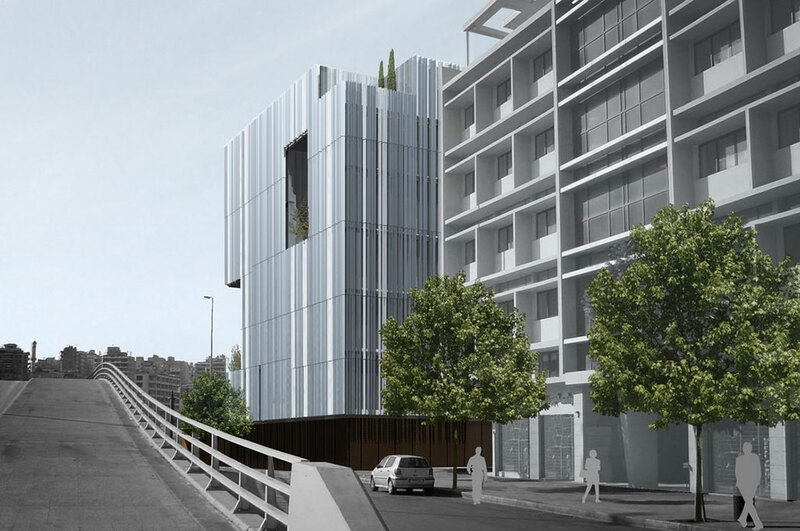 At the same time the creative industries building and gallery will make the project an important innovative addition to the Saifi Village Quartier des Arts.